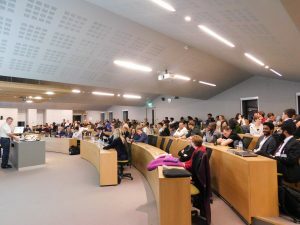 The Institute of Management Consultants and Advisers (IMCA) held a very successful inaugural ‘Talking Consultants’ competition on Wednesday 14th November, 2018, in UCD Michael Smurfit Graduate Business School. The competition was delivered under the auspices of the IMCA’s new ‘Young Consultants Group’. It aimed to highlight the critical importance of effective communication, public speaking and presentation skills to a successful career in consulting. A total of 9 MSc students participated in the competition, each one representing an accredited programme taught at one of IMCA’s partner business schools: DIT School of Business, DCU Business School, Maynooth University School of Business and UCD Michael Smurfit Graduate Business School. The competition was sponsored by PwC www.pwc.ie and over 120 MSc students were in attendance. Participating students presented on the topic: ‘The role of the business Consultant in Ireland today’. 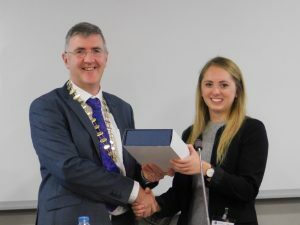 The winner of the competition was Alison Ring who is studying on the MSc in Management (Business) at DCU Business School. The competition was followed by the Institute’s inaugural ‘Connect’ event which had a recruitment, career development and jobs opportunity focus. It provided a platform for senior executives from six of the IMCA’s Accredited Consulting Practices – Cooney Carey, Genesis, IDI International, Mazars, Prospectus and PwC – to profile their firm’s activities and highlight career opportunities to the large and diverse group of MSc students in attendance.